Drive is a great book for educators because of the insight it brings on how to motivate students. While most of the book consists of how to motivate workers, many of the lessons can be applied to schools. One major theme throughout Drive is how we motivate students and workers. If we focus on schools, Pink makes the example of giving a child a certificate for drawing a picture. The child will draw the picture, but will lose further interest in drawing. Rewards are fine when doing routine work, but as America moves towards more “non routine, creative, conceptual abilities,” rewards are severely detrimental to productivity. 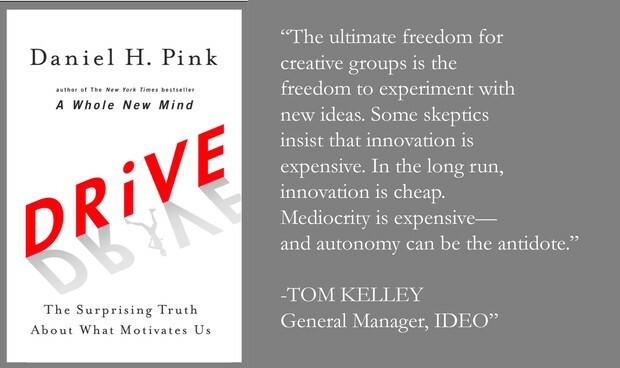 However, many teachers still use this reward model to motivate kids; Pink offers example after example on why this model fails when it comes to creative thinking. He also provides three basic elements to drive kids (and workers) to work harder: autonomy, mastery, and purpose. With these three pillars, people work more efficiently, pursue mastery, and enjoy their work. Teachers who read this book and implement autonomy, mastery, and purpose into their classrooms will experience the same results as managers who did likewise: more focused workers, better results, and an overall happier group. Pink even includes a section in his book directed towards parents and educators with specific tips for encouraging kids. He he encourages teachers to put homework thorough a test to see if it’s really necessary, give time to students to allow them to fix problems they care about, and change how praise is given. There is also a section on homeschooling and the benefits it provides. Homeschooling promotes autonomy, allowing kids to focus on what interests them, and mastery, allowing kids to spend as much time as they’d like to on a subject. While teachers don’t exactly function like parents of homeschoolers do, they can still integrate those aspects of learning into their own classrooms. 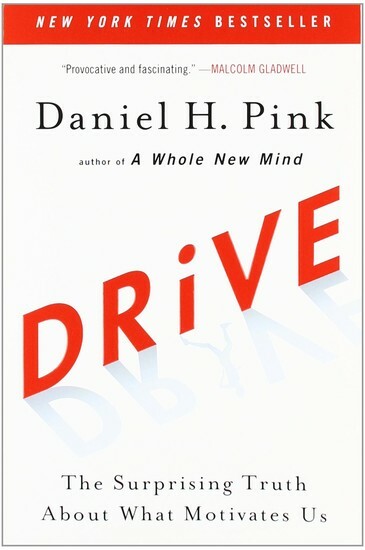 Drive focuses on three main elements for a new type of motivation: autonomy, mastery, and purpose. In the workplace, Pink describes autonomy over when people work, what they work on, how they work, where they work, and who they work with. Some of these aspects are uncontrollable in a student environment. At school, there isn’t much flexibility in what we get to learn and work on. Yes, we choose most of the classes we want to take, but within those classes, the course curriculum is so strictly scheduled that there isn’t any time for students to study and learn more about specific sections of the course. There are times where we are assigned groups, and while it’s good to be exposed to other ideas, I enjoy working with my friends and people I know rather than those I don’t like or don’t know. I tend to work harder when I’m grouped with my friends, too. However, for the most part, I do have autonomy over how I work. For example, in my College Level Comp class, we’ve written five different style of papers, all with their own broad theme. With our last paper, we had to write a political argument paper, but we were able to choose from any public policy topic to write about. In Spanish, we are studying the Spanish Civil War, but the way that we present our researched information is completely up to us. The location of where we work is, for the most part, isn’t really up to us. The problem is not in letting students move around to work; there aren’t any other places to work other than desks. At EPiC elementary, the students were scattered around the room relaxing in comfy chairs, on window seats, or leaning against pillows. The only place there are places to work that aren’t desks is in the library. As mentioned before, courses are scheduled and planned out, with little room for delays. With such rigid scheduling, there is a steady stream of due dates accompanying the assignments. Many high school students still can’t cope with simply getting an assignment done simply because doing the work will help them learn; instead, teachers must use due dates in order to prod them along like cattle. Mastery is an element of motivation that, in my opinion, is severely lacking in school. Once a concept is learned, it’s time to move on to the next concept. The only school experience where mastery has been the focus was in elementary school PEAK. One type of learning we did was called topic study. I would usually finish two or three topics per year; basically, at the beginning of the school year, there would be a list of topics to choose from, and, as an individual, every PEAK day, a couple hours would be spent on studying and making projects related to our chosen topic. We would get really into our topics and learn a lot because they were subjects we wanted to learn. This is where mastery and autonomy are linked together. If you give students leeway on what, how, and when they learn, they will learn the most. After studying tigers for a couple months, I still liked reading and learning more about them for years after. Once I got tired of tigers, I switched to learning about snakes. I’ve only ever done one project on them, but I still like to learn about them any time I get the chance. The last element, purpose, is often overlooked in school. In math class, I used to just learn the material because I had to. Now, I try to learn it see where in my life I could apply it. It helps that my teacher does give real, actual examples of when and where the math could be used-the examples aren’t the kind of math word problems of buying 50 watermelons and wanting to know if it would’ve been cheaper to buy 50 pineapples instead. Other classes, I still don’t understand the purpose of some of the content. In my EIP class of eighth graders, they finished up a unit a couple months ago about different types of numbers: whole, real, irrational, and stuff like that. As they were learning it, I’m not really sure why the learned it. The applications of knowing different types of numbers are very few. The only distinction I could think that would be useful is knowing irrational or rational. Other than that, in all of my years of math, I learned about non real numbers for about a month, then never used them ever again. Even if we mentioned them in later classes, they were ignored because, honestly, there would be no point. I can’t think of any real life situation would anyone need to use imaginary numbers. One of the motivational tips for educators and parents was how praise is given. Praise is typically rewarded to right answers and good performances. There is a lot of criticism and critiques during the process of learning, however. One thing my cooperating teacher does that I really need to do more is praising the process. Every day, when helping students with particular problems, she will praise them on doing certain tasks that will help them learn and understand, instead of saying how the answer they got was wrong and why. She also lets the students have a fair amount of autonomy; seats are still assigned, but they switch as the units do. She lectures only about once or twice a week. The rest of the time, kids get to work at their own pace on different assignments. They can work with their table group or by themselves or listen to music. They have assignments about the subject and other work that keeps other math material fresh in their minds. Her and I walk around while the students do their work, so we can easily help kids that need more help understanding. If kids are off task, she gives some gentle reminders, but if a student doesn’t do their work in class, it’s up to them to finish it some other time. I don’t have much control over how the classroom is run, but even if I did, I think my teacher has a very nice classroom setup. I do truly want to change the way I help the kids; I need to praise what they do understand, and just guide them through the rest of the process. I’ve always wanted to run my own business-a bakery. After reading Drive, there are a several business practices I would want to incorporate into my bakery. Businesses thrive on new ideas and products. Letting workers spend one day a week creating new recipes or experimenting with different methods of baking could lead to a more profitable and efficient bakery. I would think that the employees would have enough purpose to not need much from me. Mastery is something that would have to come with time. The staff could bake what they wanted and when they wanted, or only do the parts of baking they enjoyed. Honestly, the workers would be very independent as a group. They could work out problems amongst themselves, and the only type of slacking off I can really foresee happening is someone not showing up to work at all. As long as they have some interest in cooking, the job should be rather pleasant. I know in my job now, I love the autonomy I get. All I do is clean someone’s house once a week. However, I can almost always work when it’s convenient for me, and I’m usually alone in the house. I realized after I started working that I appreciated being left alone to do my work: I get some peace, but more importantly, I feel better working when someone isn’t breathing down my neck and I can work at my own pace. I’m also able to clean however I want; the supplies are there for me when I arrive. I just have to make sure the work gets done. The job isn’t very difficult either, and I do feel like I have purpose, too. I can see the immediate results of my efforts. If I run my own business someday, I would like my employees to feel the same way. Should I end up becoming a math teacher, I still would like to have a laid back classroom. I would want my students to be happy that they get to learn math. I feel that the autonomy is a big part of the enjoyment of learning. My students would all have to do some homework to reinforce what they learned, but I know that consistent and heavy workloads are stressful. Just a few problems, and I don’t know if I would take it for a grade. Once there is a reward for doing homework, it becomes less about the learning and more about getting the points. I would want students to be focused on learning and not grades. Assignments would be completion graded. I want the students to master the process of different math concepts. By the time a test is given, I would hope they’d know the material well enough to get the right answer. However, points on the test would still be given based on their work, not just points for the answer. If there are tons of examples of why carrot and stick motivators don’t work in a twenty first century workplace, why do businesses still run that way? Is it because managers aren’t aware of the science? Is it because they don’t want to change? Is it because the results of the studies don’t make sense (less management produces better results)? If many of the jobs are geared towards creativeness and businesses are moving towards this new intrinsic-motivation style of working, why aren’t schools transition too? Wouldn’t it make sense to start this style of working earlier on, rather than raise kids in Motivation 2.0 type schools who then go to work in autonomy, mastery, and purpose promoting environments (Motivation 3.0)? Why aren’t there more Montessori/EPiC like schools at the secondary level? Are there ways that I can integrate autonomy, mastery, and purpose into my own life, even though most of the tasks I have in life are based around a Motivation 2.0 type system? If “praising the process” works better, and Standards Based Grading is supposed to be looking at where a student is in the process of understanding, why do I hear so much negativity about SBG? 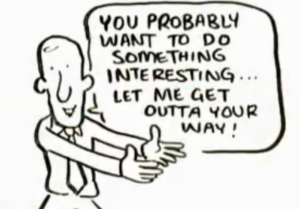 Is it just the way that some teachers implement it that students seem to not like about SBG? Have there been any studies that show the success/happiness later in life of students who go to Montessori schools/homeschooled compared to students who attend public school? Do the former tend to choose jobs where Motivation 3.0 is valued and used? Do public school students choose less creative, Motivation 2.0 style jobs?